There are 364 days out of 365 that are not Halloween, right? So what do you do when you've come up with the most brilliant costume idea ever but it's, say, the middle of April, no where near Halloween? Some people think we can't dress up on any other day of the year and if we do, we're considered (*gasp*) weird. Let me introduce you to the idea of: cosplay. According to my good friend Google, Cosplay is: "the practice of dressing up as a character from a movie, book, or video game (especially one from the Japanese genres of manga and anime)." 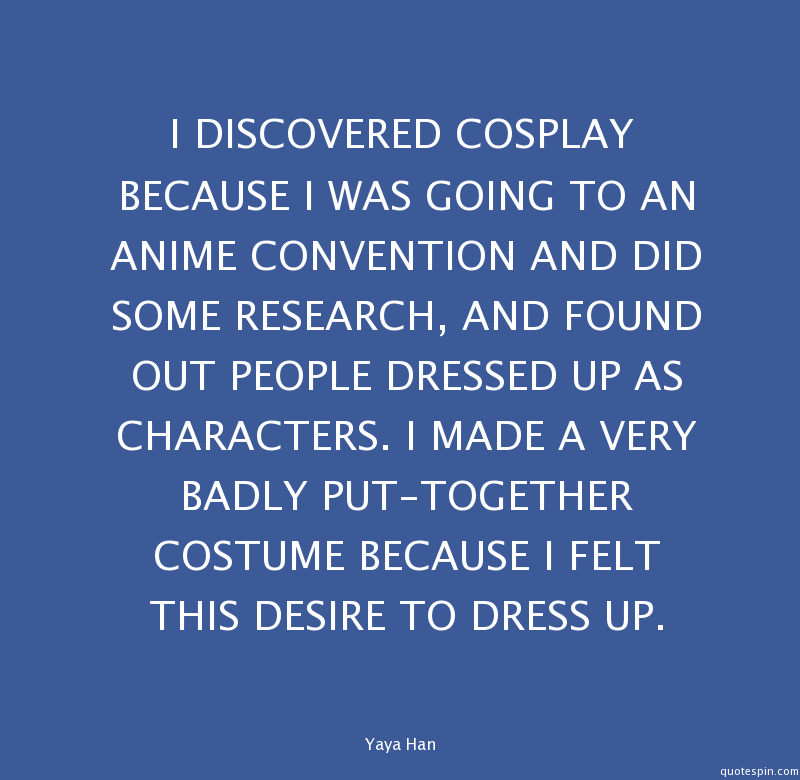 That last bit, shows where the practice of cosplay came from: Japan (obviously). But it's definitely become a popular thing recently for people across the world and beyond anime and manga. Events like Comic Con have made it more acceptable to go out in costume and have fun. Personally, I think being a fangirl wouldn't be complete without the fun of cosplay, whether you actually take part or simply drool over pictures you've seen and daydream about having the guts and glory to do so. It's fun to dress up and step into the shoes of your favorite character, and taking pictures is half the fun as well. However, I've drooled over those pictures of crazy exactly-to-the-detail costume and bugged out about the cost of such costumes. How in the world do people cosplay so many different ones when they cost hundreds of dollars? I for one would never be able to afford such a costume, yet I've cosplayed many times over the past few years and I doubt I've spend more than $20. Sky and I are here to give you some advice with the hopes that you will find the courage in your heart to step out into cosplay and also not to spend a lot of money doing so. Cosplay shouldn't be something that's "weird" or expensive: it should be fun and adventurous! Here are our tips for cost-efficient cosplaying. Sky and I both have discussed our cosplaying strategies and our first thoughts were to look in our own closets. Most of the things you could use for a cosplay costume can be found within the contents of what you already own. Carefully searching for shirts, pants, socks, and shoes that can match or almost match a character's costume is efficient and effective in saying yourself money (just be careful not to fall too fall into the closet and find Narnia. Unless of course, you'd like to cosplaying as a king or queen for a few decades). This is my friend Jacob as the 10th Doctor (Doctor Who). He used a blue button-down shirt as a suit jacket and completed his look with a trench coat and spiked up hair. He owned everything he used ahead of time. Looks pretty good, right? For me, I already owned a white button down shirt and dark boots that I've used on numerous occasions for cosplays. Think simple, think in similar colors. When it comes to cosplay, it doesn't have to be exactly the same, just look for things that are similar or almost. For fun, my cousins and friends made a short zombie film and most of us had to dress as zombies from a hospital setting. We didn't have exact hospital gowns, but we have a few shirts that looked close enough. 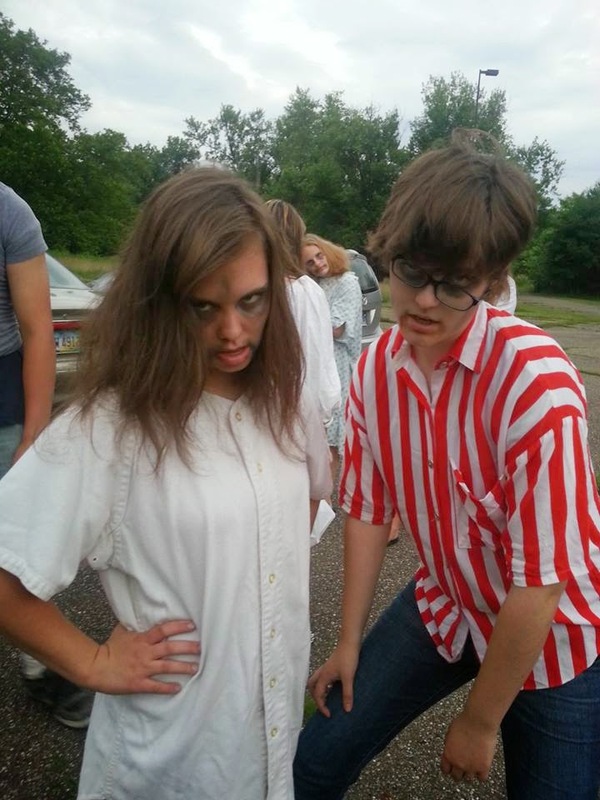 Mine was red and white striped, and we had another that was a weird shade, but it looks great in the video so it worked out well (the zombie make-up helped as well). Sky here! Last year, I did an impromptu cosplay of Stiles Stilinski from Teen Wolf. My inspiration was based on what a female Stiles would probably look like. It was 3 am, so what else was I to do but ransack my closet? 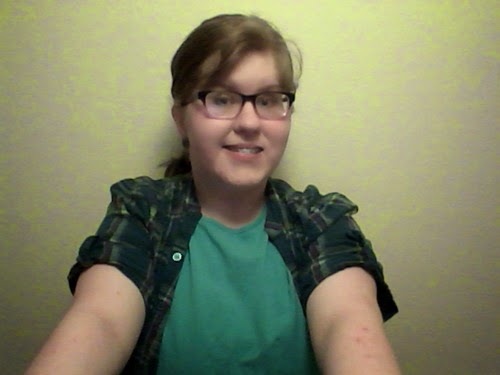 Stiles wears a lot of plaids, so I found a plaid shirt. I wore my hair in a ponytail, picked earrings I thought Stiles would wear, and then took some photos. (If you feel like you are a character, then you are that character. That's my #1 cosplay rule.) I felt fantastic about it, and the most important thing: it was extremely fun. 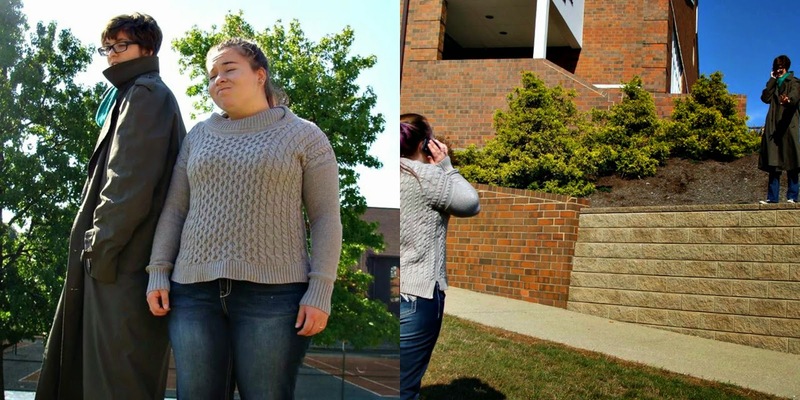 It led to this follow-up Stiles cosplay, and it taught me that you can cosplay right out of your own house. It's like playing dress up, only way better. Fangirl life is so cool. On numerous occasions, I've asked other people for clothing items. My mom or dad usually have something that works, or even a few of my friends. 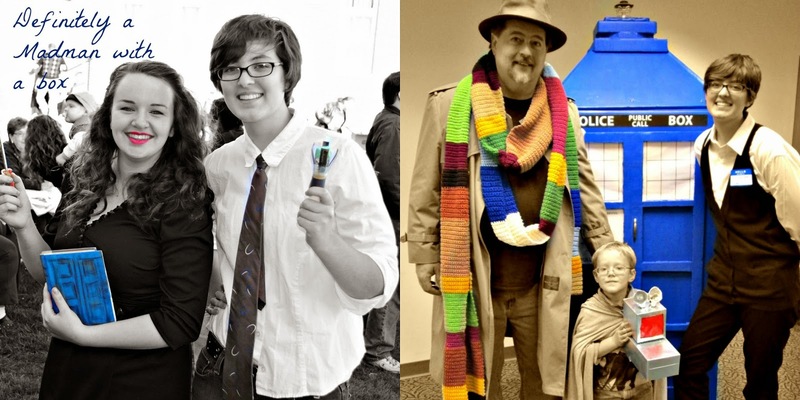 I dressed as the Raggedy Eleventh Doctor one year for Halloween and I borrowed a tie from my dad. It wasn't a perfect match but it looked similar and it worked. My mom usually is helpful in helping me design pieces to mix and match to make it work, or we borrow costumes from my church's stash. 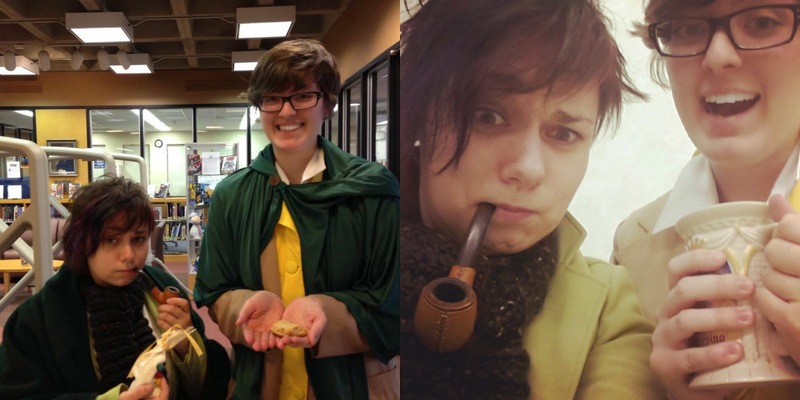 For Tolkien Reading Day this year, my friend Anna and I dressed as two hobbits. Neither of us have actual hobbit outfits, but she had a pair of pants and two jackets for me to wear and she borrowed on of my shirts. She got most of the pieces from her parents' closets. While my character (Merry) was supposed to have a green jacket and yellow vest, I had a brown jacket and a yellow jacket underneath to look like a vest. It worked out well and nobody even knew I was wearing two jackets. I'd call that success. 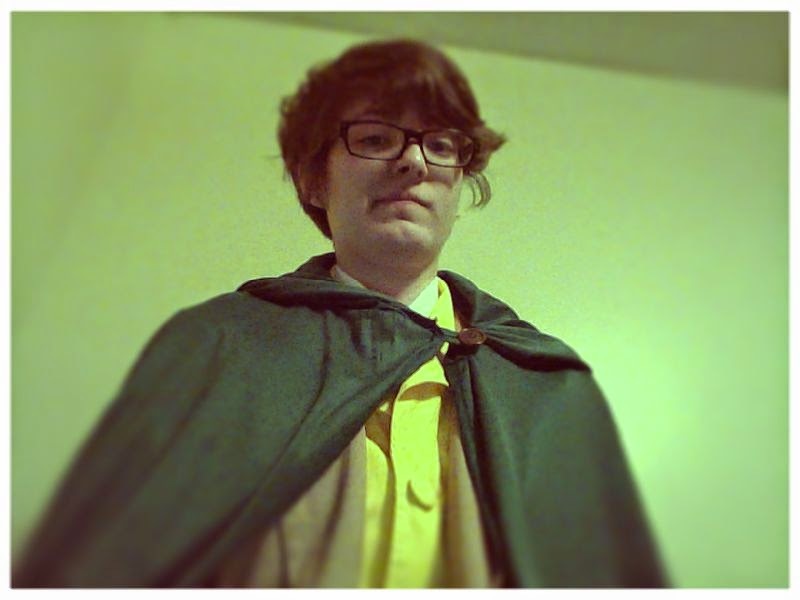 Meriodic Brandybuck, at your service. Nothing is better than finding gems among thousands of recycled clothes. Whether you head to the Salvation Army, Goodwill, or local thrift stops and secondhand clothing shops, you'll sure to find something interesting and for a cheap price. Need black pants, a plain colored shirt, maybe even a vest or a hat: these are the places to look. I found an old brown jacket that matched the Indiana Jones style quite well. It didn't cost nearly as much as buying it new. Myself as Mikasa from Attack on Titan (minus the cape). I got a cheap, brown jacket from Goodwill and added the Survey Corps Logo with paper and pins. On many occasions, I've found the perfect piece to complete my outfit by searching through racks of clothes. Paying little for such a prize definitely feels good when you dress up and look spectacular. You might even be able to find shoes, props, and other such items to help you really pull of the quest of the decent cosplay. 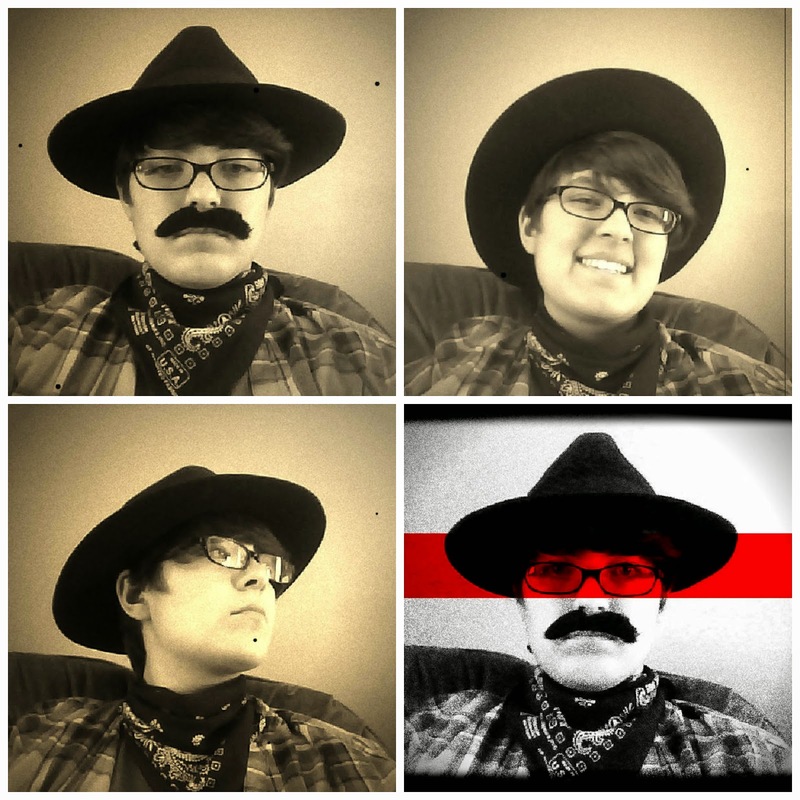 My church had a western-themed VBS, so I found a cheap plaid shirt to wear, added a handkerchief, used my Indiana Jones hat, and added a fake mustache to seal the deal. I'm ready for Woody's Round-Up any day! While I know not everybody can sew or design a entire costume on their own (I know I can't), you might be able to make something small toward your outfit by thinking creatively. Fabric can be pricey, but if you're looking for a decent cosplay and you're willing to spend the money for a perfect fit, you might want to think about making something from scratch. You might also want to look around your house and stash to see if there's any fabrics or other items you've already collected that could be useful. In addition, if you can make something that you can use multiple times it's even better. 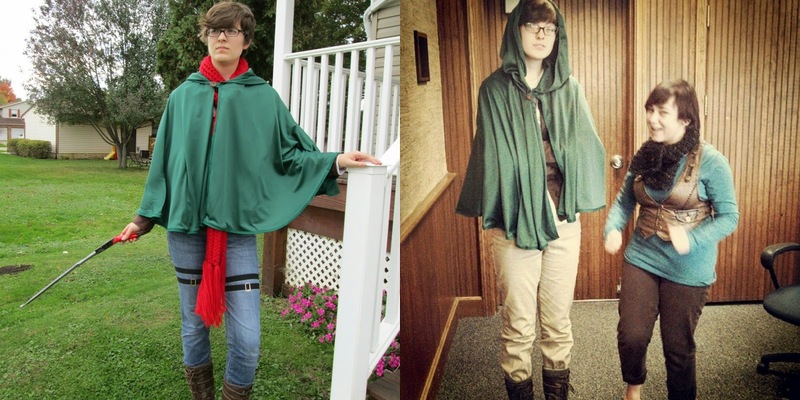 I made a green cape for an Attack on Titan costume, but since then I've dressed as an elf and a hobbit and used it. There's a lot of possibilities for multiple uses of costume pieces. Picture One: Myself as Mikasa from Attack on Titan. Picture Two: Myself as an Elf and my friend Anna as a hobbit. I know of someone who is making a dress for every month of the year this year. While she's definitely over-the-top and talented, I adore her pictures. She's been using old dresses, t-shirts, and anything else fabric-wise to create the outfits; and she's asked other people to donate anything they don't want for her to use. My mom also has made numerous accessories for outfits myself or others that have cosplayed in the past. She has made a fez and peter pan-style hats out of felt, a gas mask made of bubble wrap and paper, and even a K9 (from Doctor Who) hat out of a shoe box for a little boy to wear. In addition, I'm positive there are plenty of DIY instructions for various cosplay outfits or costumes out there on the internet. Picture One: my friend, Erinn, and myself as Dr. River Song and the Raggedy Doctor with homemade sonic screwdriver (read below for more on that). 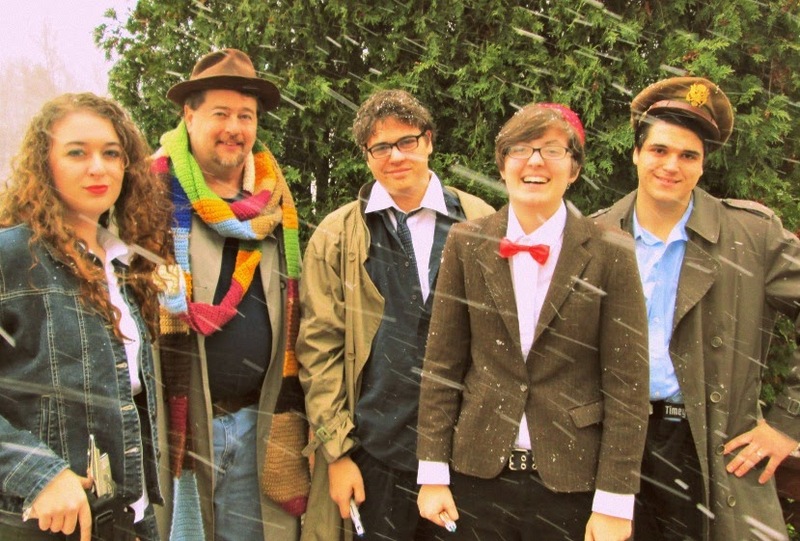 Picture Two: my dad, my little buddy, Luke, and myself as the Fourth Doctor, K9, and Sarah Jane Smith. My aunt made the Who Scarf and my mom made the K9 hat. The TARDIS was also made by my mom's friends and adds to the photo. Sky again. 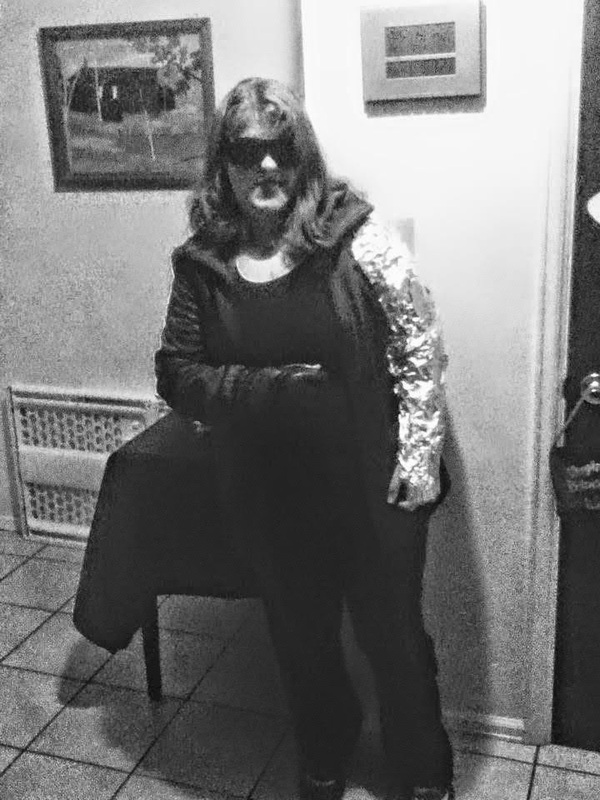 For Halloween last year, I cosplayed as Bucky Barnes. It may have seemed impossible, but I was determined to make it work. Of course, the hardest thing to figure out is how to make a metal arm. Never fear! That's what tin foil and a red solo cup is for. 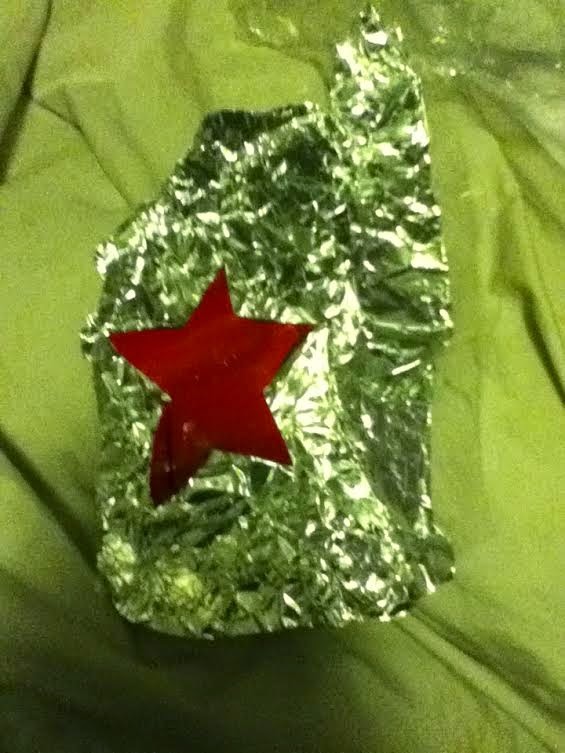 I took a leather jacket and taped tin foil to it, then cut a red star out of a solo cup. While it fell apart rather quickly towards the end of the night, it worked well for the moment, and I felt totally cool. Everyone should dress up as an assassin at least once in their life. Now I know we're going for cost-efficiency here, but sometimes you might just have to spend a little bit of money. There might be certain items or details you can't make no matter how hard you try. That's okay. Spending a little money--as long as you try your best to be efficient with most of the costume--is okay. 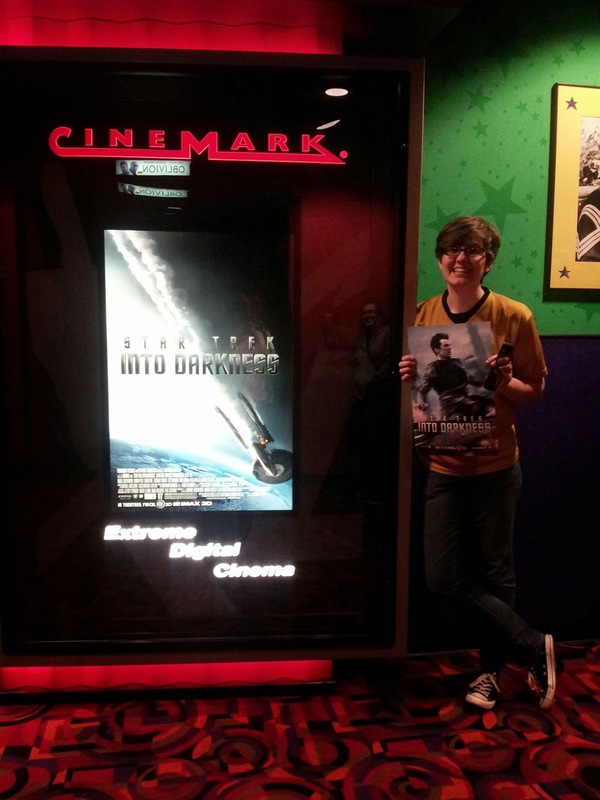 So this isn't an "official" cosplay, but I was stoked for Star Trek Into Darkness and wore my Star Trek uniform shirt I bought from a Cheez-Its special from the first reboot Star Trek movie. And I finally got a picture with Benedict Cumberbatch (note: poster in my hand). Cosplays can be small things like wearing the right shirt. 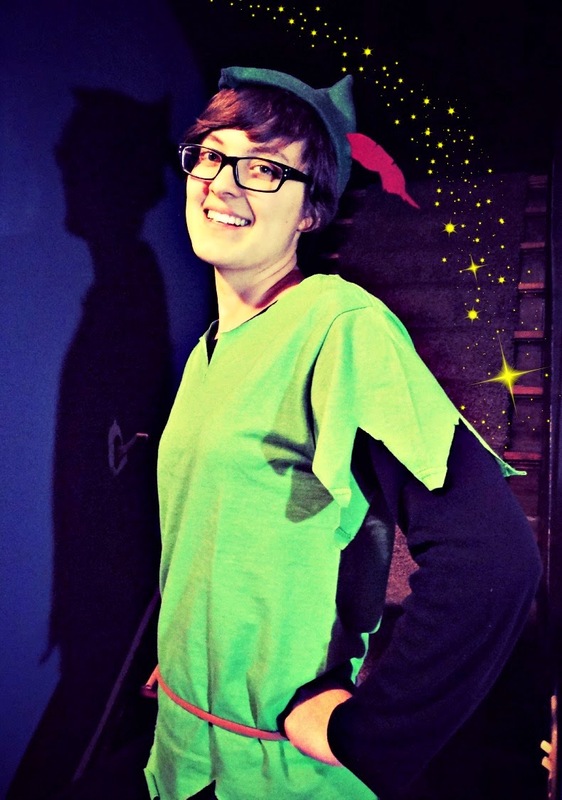 For one my cosplays I dressed as Peter Pan and I needed a green shirt. I didn't go some place expensive and find the best green shirt in the world. I knew I was going to cut pieces off and make it look like Peter Pan's ragged, jungle-boy shirt. So I bough a cheap, $5 t-shirt from Wal-Mart and found brown fabric at home to make myself a belt. I've also created my own TARDIS shirt with the same method: I bought a cheap t-shirt of the right color and drew the black lines of the squares and scrawled "Bad Wolf" on the back in white paint. I didn't worry about having the right color of pants or shoes, I just went with the top half of my costume looking superb. If you have to buy something, budgeting and contemplating money spending is a good way to not spend loads of money. Cosplaying in costume is great fun, but in addition, you might want to add a little something to make it feel truly magical. You can always add a few props to help you along. When I dressed as the Eleventh Doctor, I made a fake sonic screwdriver by covering up a flashlight with paper and a toilet paper roll. It took me maybe ten minutes tops to create it by drawing and coloring (later I did end up getting a plastic one that lights up). When I was a hobbit, I carried around a tankard-like mug (with Sleeping Beauty on it). It gave the impression that I had just come from the Green Dragon or I was drinking an Ent-draught. Props and other small accesories like hats, badges, and scarfs can help seal the deal on your cosplay. My friend Anna and myself as hobbits (Pippin and Merry to be exact). She has her pipe and bag of Old Toby (really tea leaves) and I have homemade lebmas bread and my (Sleeping Beauty) tankard. In addition, there's the fun of taking photos with your cosplay and others. A part of that is finding the best place to take the picture and also how to stand in the photo. While not everybody has picturesque settings to roll in the background, you can still find good neutral-style backgrounds that don't clash with your costume. But if you're a specific cosplay costume that works in certain settings, go for it! Dress up as Katniss and go find a tree to stand by; be a superhero and pretend to save someone or stand on a busy street corner (or find a phone booth to pose by); be a rabid fangirl (foaming at the mouth included) and chase someone down. You can even draw your background if you have the talent! addition, you can pose like your character to feel more authentic. Dress like the Doctor and copy his poses; dress as Sherlock and pretend to jump off a ledge (pick one that isn't too far up though! ); strike a post like the Avengers. For Halloween last year, myself, my beau, and his brother dressed as DC characters. First picture: Jacob and William (my beau) as Bruce Wayne/Batman and Clark Kent/Superman (playing off the movie coming out!). 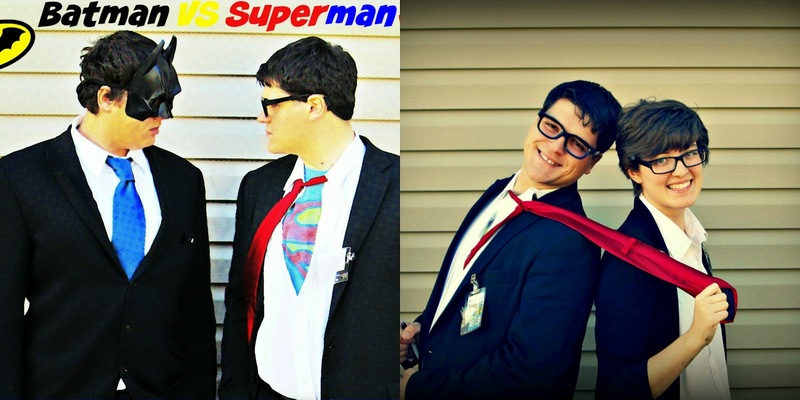 Second picture: William as Clark and myself as Lois Lane (mimicking Smallvile-style photos). In addition, once the photos are taken you can always spice them up with special affects, words, and cool additions. Maybe that's cheating, but who cares if your having fun, right? Cosplay doesn't if work you don't have fun doing it. Be confident and bold in your decision to dress up and nobody will make you feel "weird" for doing so. If you're having fun whether your outfit was thrown together on the spot or is a mismatch of crazy pieces or an authentic-just-like-the-real-thing replica, it'll work all the same. 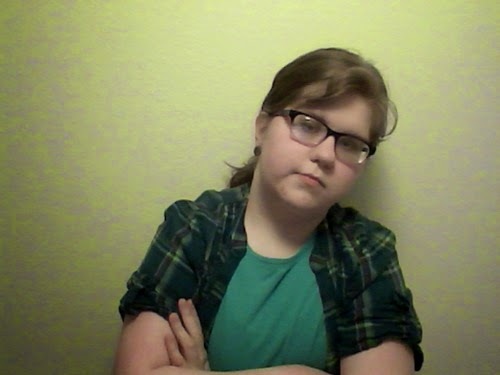 I've had plenty of costumes where my pants weren't the right color, my glasses or short hair didn't fit the character, and I was a girl instead of a boy. But I didn't let any of that stop me: I dressed up, I had fun, and I felt good. Remember: you're doing the cosplay because you want to. Not because you're trying to win an award, impress someone, or brag that you have this much money. No, people cosplay all sorts of costumes, mash-ups, and ideas because they think it's cool and they want to show people their ideas and have fun doing it. When you cosplay, be bold, be brave, and be initiative. 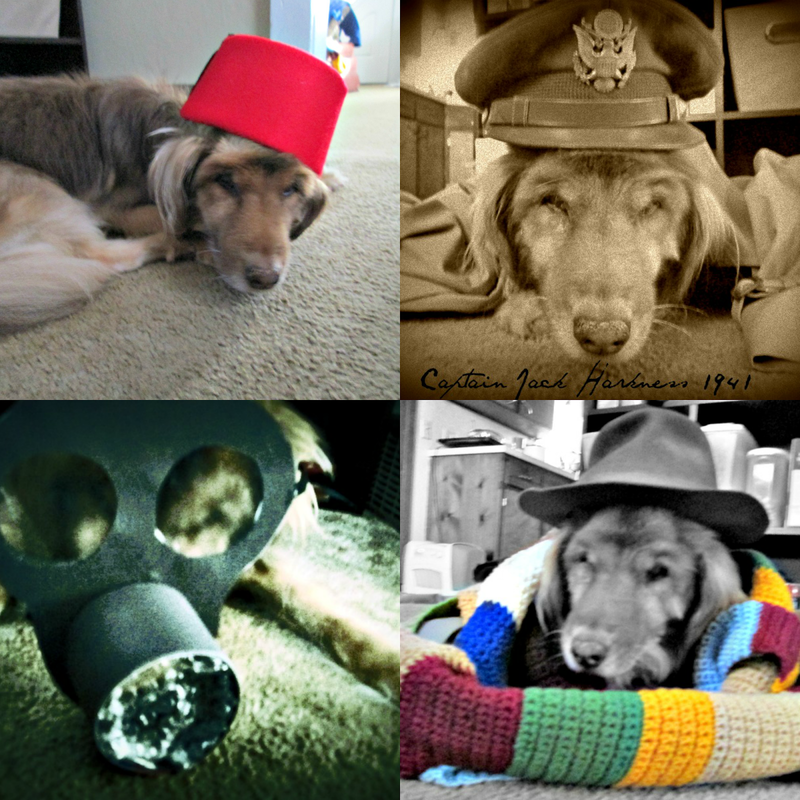 This is my (late) puppy dressed as four Doctor Who characters for the 50th Anniversary: Eleven, Captain Jack Harkness, Gas Mask Child, and the Fourth Doctor. I don't think he appreciated it as much as I had hoped, but he looks pretty rad. We want to see your cosplay photos! Send them to us at our Facebook page or via the Twitter hashtag #TFIcosplay. 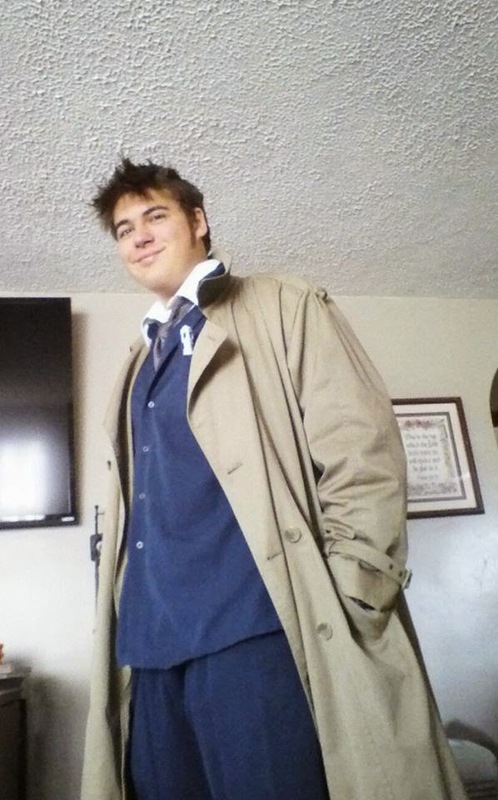 Random aside #1: Your friend Jacob should totally cosplay as Castiel, if he hasn't already. That trench is perfect. Random asides aside, this looks like loads of fun! Great tips to keep in mind if I can ever convince my sister to go Winchester with me. (I'd do it on my own, but one Winchester without the other is just wrong.) And the range of characters you've cosplayed as is insane! Oh my gosh! You should totally do Winchester (please, if you ever do: send TFI pictures. I'd love to see!) & which would you be? Sam or Dean??? Thanks so much, Jenna! I agree. Stiles should definitely be a mini-Winchester. Plaid and layers are where it's at, yo.